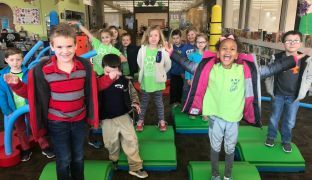 Over 75 excited visitors converged at the Chattanooga Public Library last week to experience an innovative new play product that is designed to spark the brains of its youngest patrons. "In many ways our library is a learning playground for kids of all ages. Now, with Snug Play at our downtown branch, there are even more child-directed play options where children choose what to play with and then make up their own rules. 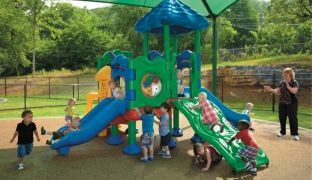 And kids are always going to climb, so why not give them the equipment and a safe place to do so," stated Corrine Hill, Director of the Downtown Chattanooga Public Library. The downtown branch received their Snug Play equipment on a Wednesday and wasted no time having it installed in time for a busy Saturday in the children's department. The portable nature and interactive, dynamic pieces stimulate spontaneous and cooperative play that invite both children and adults to participate and engage in meaningful play. A library, at first blush, seems to be an unusual space for indoor play equipment. Lee Hope, head of Children’s Services thinks otherwise. "Why NOT a playground at the library? 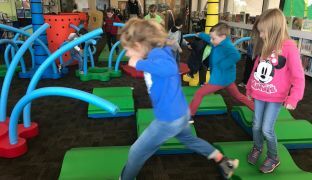 We are still all about books and fostering a lifelong love of reading and learning, but play is one of the ways children learn, so installing a library playground just makes sense. What's more, our playground is surrounded by books in every direction whenever they are ready." The leaders of Chattanooga’s Downtown library recognize the importance of play in a child's development. Movement and play are good for children's coordination, strength and overall health. The new indoor play equipment will help children make new friends naturally and develop their social skills. “This is not your mother’s library anymore” stated a grandmother visiting the new SnugPlay area at the Chattanooga Public Library. Evidently parents and children agree.